Minor cuts and scratches can be treated at home or on the road. Larger lacerations may also need to be dressed until medical help can be obtained. Cleanliness is key. Stay Safe. If you are not the patient, practice universal precautions and wear personal protective equipment if available. Clean the wound with running water. Wash the skin around the injury with soap. Don't worry if soap gets into the wound, though it is likely to sting and irritate the raw tissue. Rinse the wound thoroughly to rid it of any dirt and soap. Tweezers can be used to remove particles. Use of hydrogen peroxide is neither necessary nor encouraged (see tips below). Only cover the wound if it is likely to come in contact with clothing or dirt. Cuts less than 2 centimeters long can be held closed with butterfly bandages. If the edges of a laceration are not easily pulled together, then the wound may need stitches. 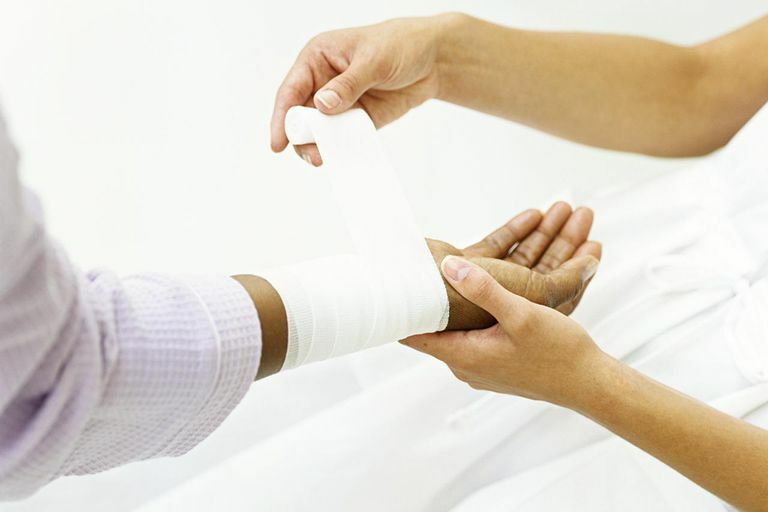 Adhesive bandages are the easiest way to cover most minor lacerations and abrasions. Hydrogen peroxide is not necessary to adequately clean a wound. The bubbling action of hydrogen peroxide creates oxygen gas—more than blood can handle. Surgeons using hydrogen peroxide to clean deep surgical wounds have accidentally triggered gas bubbles in the bloodstream (known as a gas embolism), a potentially deadly condition. Very little evidence exists to show the effectiveness of hydrogen peroxide on minor lacerations, and plenty of evidence is published on the merits of plain old water—so just use water. Antibiotic ointment is not necessary for a wound to heal nicely. Ointment will help raw injuries—such as abrasions—be less painful. National Guideline Clearinghouse (NGC). Guideline summary: SOLUTIONS® wound care algorithm. In: National Guideline Clearinghouse (NGC) [Web site]. Rockville (MD): Agency for Healthcare Research and Quality (AHRQ); 2013 Sep 01.